These are great if you love words and you can earn money from compiling crosswords for newspapers and magazines. Some of the broad sheet newspapers like The Daily Telegraph, The Guardian and The Sunday Times have their own team of regular puzzle compilers. They also have people who compile their sudoku and other word or number puzzles. However there are still some great magazines and newspapers that need one and will pay you to compile a grid, the clues and answers for quick and easy or cryptic ones. When compiling one as a professional you should follow standard rules. The most widely recognised rules and regulations are laid out in books such as Chambers Crossword Manual and Chambers Dictionary. These books contain helpful advice for the puzzle maker about the standard rule of the grid, how to set out clues and common cryptic clue meanings. There are special software programmes that can help you with their clues. Some editors don't mind you using these, whilst others prefer original and unique ones using the writers own style. 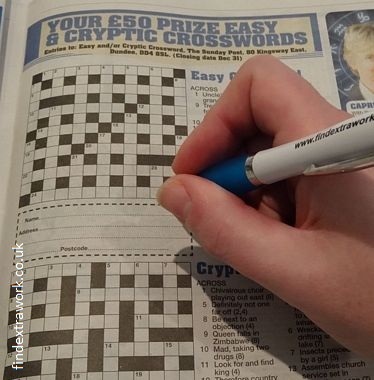 Another method of securing crossword compiler jobs is to complete them and send them into the various newspaper and magazine competitions and prize draws. Some of these can be for top prizes in the hundreds of pounds. You will be competing against other competition fans, but because a high level of skill and knowledge if required the number of entrants can be low. This increases your chances of winning the prize. You can increase your chances further still by sending in a tidy grid, ensuring it is fully completed and comply by the closing date. Prize ones can be found in most Saturday newspapers like The Telegraph and Sunday papers like The Sunday Express. Local papers usually have them and though the prizes are less in value they attract fewer entrants so you could win often. Income earned as a crossword puzzle maker should be declared on your income tax self assessment forms. However you can add any expenses such as dictionaries, thesauruses, paper, postage, etc to your expense sheets. I think prizes from competitions are free from income tax and need not be declared but do please check with your local tax office. Rates of pay for crossword compilers is something I have been unable to learn. If you are a puzzle maker and would like to share your experience to help other readers then please contact me so that I can include this information. Findextrawork heard from someone who was paid by the Daily Record newspaper to compile their giant one which appeared in the Saturday magazine. The Daily Record paid £150 for each one nine years ago. He did find it a time consuming and it was a mixture of cryptic and easy clues. Syndicated Crosswords is another possible option. Organisations may pay you to compile puzzles, quizzes, word searches, etc for which they can sell on to groups of newspapers and magazines. Each newspaper and magazine may be to busy or not have the experience and may find it cheaper and more cost effective to buy them in. Below is correspondence from puzzle makers who have added to this discussion. I am a syndicated compiler, have self-published many books, and written two puzzle books for a series of volumes. Regarding rates of pay - generally not too good You honestly can't make a living at it (I've tried for years!). I'm a syndicated puzzle writer and make on average about $300 a month for writing several regular puzzles - and this is after being on my syndicator's books for years. When I first started out I was lucky to make about $20 a month - for hours of work. If you aren't in one of the major metropolitan papers (which are almost impossible to break into unless one of the regulars dies), the rates of pay can be as little as $10 each or less (the hourly rate is awful!). Rates of pay via a syndicator are based on subscription and print numbers (so a small print-run paper will pay much less than a major paper for the same one). The syndicator will also take a cut of your earnings, generally around 30%. Editors from the major papers you mention on your page are inundated with submissions, and very rarely reply. It's not a reliable way to find work. Jobs for full-time compilers are extraordinarily rare. Print newspapers are also in trouble, laying off staff, with falling income from sales and advertising, and many are cutting paid content (especially puzzles). My income from print has dropped drastically since the global financial crisis. You need to have many years of experience, especially in writing cryptic clues, before submitting any to an editor. Chambers is about the only book still in print on how to write cryptic ckues. Sorry to be rather disheartening, but it is a tough industry, and not a very viable thing to suggest to your readers, really ... they can certainly give it a try, but it's not as easy as it sounds from your web site ;) I hope this is of some help on your page. Find out how to play quizzes for prizes.